Mayor speaks in what appears to be Jamaican patois in video filmed Monday. A new video featuring a seemingly intoxicated Rob Ford was uploaded to YouTube on Tuesday. The mayor, who earlier claimed to have quit drinking, confirmed he had “a little bit” to drink last night. 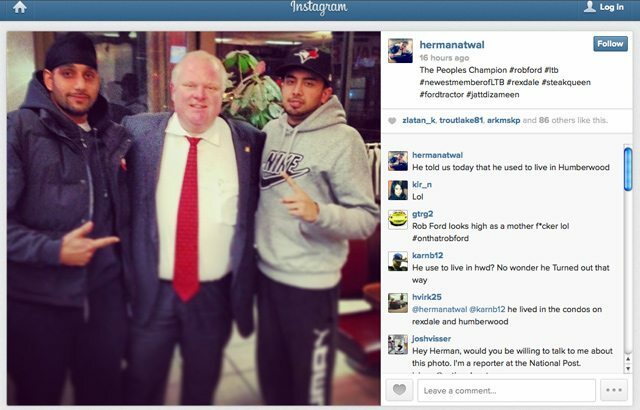 An Instagram photo, since removed from the site, places the mayor’s visit before 10:00 last night. The mayor did not show up to City Hall today until 2:15 p.m., long after the 12:30–1 p.m. estimate his staff provided reporters. This incident follows released emails from former mayoral staffers, showing an office that doesn’t know where the mayor is for days, tracks his whereabouts via social media, and warns one another when he enters the office around noon. Before the mayor made his admission late this afternoon, Doug Ford (Ward 2, Etobicoke North), who is also serving as his brother’s campaign manager, claimed that the video could not have been from yesterday because the mayor is “much thinner now” and he was speaking with him at 10:30 p.m. last night. He also claimed his brother was focused on healthy living, arguing the mayor had turned the corner from the events of six months ago. Journalist: Mayor Ford, when was that video from? Journalist: Were you drinking last night? Journalist: You were drinking last night? Ford: A little bit, yeah. Journalist: Do you think that was offensive to people? Ford: No, this wasn’t offensive. What I do in my personal life with my personal friends, that’s up to me. Ford: –It has nothing to do with, it has nothing to do with you guys. It’s my own time, it’s with my own friends. Journalist: Did you use drugs last night? Journalist: Have you installed a breathalyzer? Journalist: Were you driving last night? Journalist: How did you get there? Ford: No, no, no, no. Journalist: Mayor Ford, you said you quit drinking on November 1. Journalist: When did you start drinking again, Mr. Mayor? Journalist: Can you comment about the police chief? Journalist: Did you ever stop drinking? Journalist: Don’t you need help, Mayor Ford? Ford: I answered all the questions. Journalist: That’s not true at all. Ford: I’m telling you I was there. I met some friends. If I speak that way, that’s how I speak with some of my friends. I don’t think it’s discriminative at all. Journalist: Did you lie when you said you stopped drinking? Journalist: Did you lie? Did you lie when you said you stopped drinking? Ford: That’s my own time. Journalist: When did you start drinking again, Mayor Ford? Journalist: Who drove you? Who drove you? UPDATE 7:25 PM: A second video has surfaced on YouTube which appears to be from last night. In it Ford is seen only twice, for a few moments each; he appears to be meeting with his friend and sometimes driver, Sandro Lisi, who currently faces extortion charges in connection with alleged attempts to obtain the crack video.